United Kingdom - The all-new Isuzu D-Max Arctic Trucks AT35 is a bakkie engineered to excel in the most arduous conditions, and is the result of close technical collaboration between Arctic Trucks and Isuzu UK. The AT35 retains the D-Max’s one-tonne payload and 3.5-tonne towing (braked) capacities. Unfortunately, this bakkie is a UK-specific project and Isuzu South Africa said it was unlikely to reach our market. 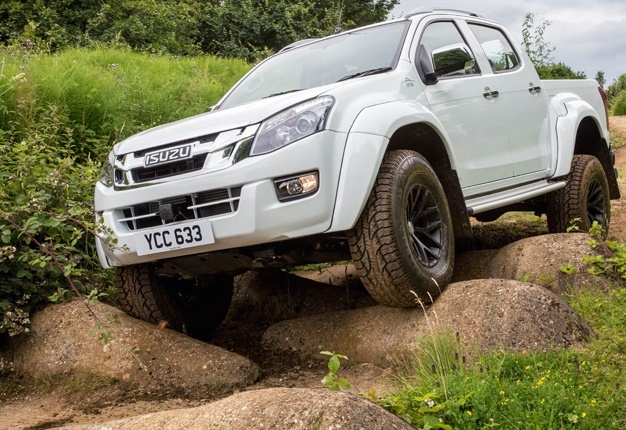 The Isuzu D-Max’s suspension is re-engineered exclusively for the AT35 with Fox Performance Series dampers to help increase mobility over rutted tracks and brutal boulders. Special all-terrain Nokian Rotiiva AT tyres are fitted to the AT35. These huge 35" tyres are specifically engineered for off-road use and are fitted to 17”x10” alloy wheels. The vehicle accommodates the larger diameter tyres and wheels within dramatically-widened wheel-arches. The AT35 is available in double-cab and extended-cab configurations. A six-speaker audio package with an ‘Exciter’ speaker in the roof lining, plus iPod/USB/Bluetooth connectivity, provides the sound. Heated and folding door mirrors (including side indicator repeaters) are standard, as is a leather steering wheel with audio and cruise controls. The double-cab model also includes full leather upholstery, as well as automatic climate control air-conditioning. Exterior standard features include projector headlamps, body-coloured front bumper, chrome trio of door handles, grille and rear bumper, LED rear lights and a rear load liner. The double-cab model also adds roof bars and rear parking sensors. The AT35 is based on the Isuzu D-Max’s chassis. It is made of high tensile strength steel with cross-member braces for torsional rigidity. Under the bonnet of the D-Max Arctic Trucks AT35 is Isuzu’s 2.5-litre twin-turbo diesel engine that delivers 120kW/400Nm. The double-cab AT35 can be specified with either a manual or automatic transmission. The five-speed auto features sequential manual shift control. A shift-on-the-fly two- /four- / low-ratio four-wheel drive selector dial is located on the centre console. The system allows drivers to switch between two-wheel drive and high-ratio four-wheel drive at speeds up to 100km/h. Low-ratio four-wheel-drive can be engaged while stationary with the transmission in neutral.